March 19 3305: Arrived in Philipea W-KE Yadda Yadda, the Crown of Ice system. 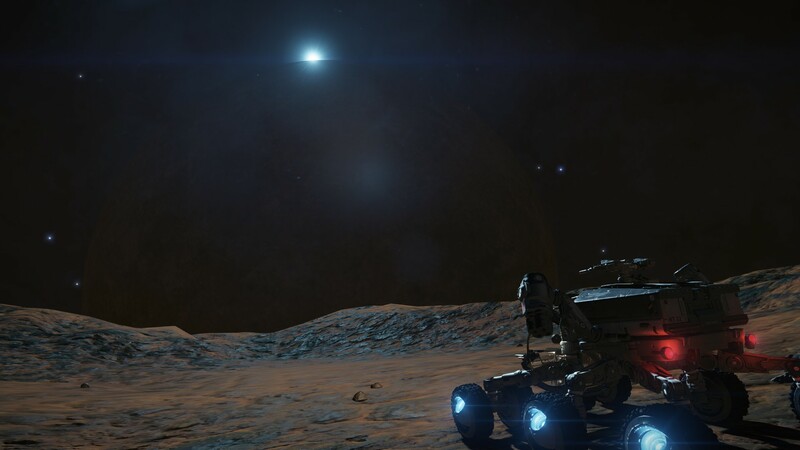 Trip here had been relatively uneventful, my new update to my market connector now pings planets with high deposits of notable materials when scanned, which I find very helpful. I've been only stopping for Water/Earth worlds and have discovered a few, but one can't tell if anyone else has on this expedition so I'm not going to count my creds until turning in. I plan on turning in back in the bubble, so everyone in the fleet will get first dibs on exploration credit. Anyway, I cruised through the crown of ice. My surface scanner picked up a hotspot while flying over, y'know, you get them in areas of increased surface mining deposits, but I dropped lower to take a closer look just on a whim and I actually picked up some cargo signals. About 5 or so cargo containers, Polonium, Uranium, some other things, most notable to me was the bootleg liqour. The cargo was at the bottom of one of the famous thin canyons the crown of Ice is known for. The source of the cargo was a SRV that was fused to the side of the canyon, frozen to it under some ice layers. No idea how it got there, the cliff face is too shear to climb. Maybe someone was trying to jump the canyon, but why do that with a hold full of cargo? I attempted to retrieve the moonshine, for research purposes, but found it troublesome. I found my ship wedged at the bottom of the canyon multiple times, enough so that I started to get worried I'd share the same fate as the SRV. March 20, 3305: Arrived in the Black Giant nebula. Very picturesque. Scans of the planets show them having high quantities of materials I'm short of, going to hang here for a day and gather mats. March 21: Arrived in the Breakthrough Echoes system. It's a green system, in more ways than one, 3 ELWs and a WW here. Going to try to get some more Yeet for jumps. Caught a beautiful sunset. Wasn't on the planet I was on, but it was beautiful none the less. A binary pair of planets are only a few mega-meters apart in this system. I'm close to the basecamp and its only mid-week, I might spend a day mining this before moving on. I've got enough jumponium that I'm not worried, but having an excess amount of them I think will make the going much easier for me. Out in the Abyss planets won't be so close together, I'll have less of a sample size to gather supplies from. After I'm done I'll head straight to basecamp.